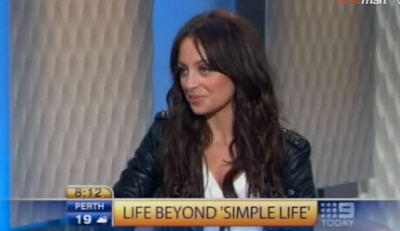 Nicole Richie appeared on The Today Show in Australia yesterday morning. Click Here to see the video of Nicole Richie on The Today Show. Got the say the woman who interviewed Nicole asked a lot of random questions but Nicole handled it well especially regarding the wedding question. the questions were terrible huh! what's worse of all is the interviewer used to be the editor in chief of lots of australian women's mags like cosmo etc. oh dear! OMG I thought the interview was terrible, Lisa Wilkinson is a fantastic host & interviewer but Nichole Ritchie gave her nothing !!! she was sooo boring !! I felt sorry for lisa, all Nicole said was óhh thankyou""& yes. She could have talked more about her fashion line or the kids or joel or anything she really had nothing to say, very dissapointing!! It was like Nicole had been over prepped by her own PR. Then you got someone like Tori Spelling who just says it how it is !